A new U.S. Department of Agriculture report released in mid-January has found that greenhouse gas emissions associated with producing corn-based ethanol are about 43 percent lower than gasoline. An ethanol tanker at the Illinois Fire Service Institute on Sept. 7, 2016. USDA Secretary Tom Vilsack said the report provides sufficient evidence to show corn-based ethanol can be an environmentally friendly alternative to fossil fuels, despite a series of recent reports that have suggested otherwise. The new USDA report found greater lifecycle greenhouse gas reduction benefits from corn ethanol than previous studies, according to the department. USDA determined that the improved benefits stemmed largely from better farming and refining techniques, including reduced tillage and the use of cover crops. The report was produced for the USDA by ICF, a global consulting and technology services provider. USDA statistics show that ethanol production in the United States has increased drastically throughout the past decade. In 2005, the ethanol industry produced about 2.9 billion gallons per year. By 2015, that figure spiked to more than 14 billion gallons per year. 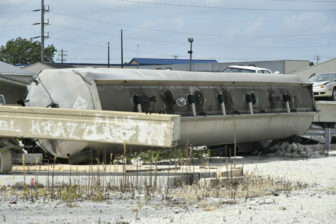 See related: "Ethanol spills on the rise in the Midwest"
See related: "Reports question environmental good of ethanol"